No winning streak can last forever—not even the one being put together by the University of Connecticut women's basketball team—but what will is the thrill in watching one team chase history while another tries to stop them. This story first appeared in the Jan. 16, 2017 issue of SPORTS ILLUSTRATED. To subscribe to the magazine, click here. The last few weeks have been fat times for the world’s spoilsports. Chelsea won 13 straight Premier League games, tying the all-time record, only to fall 2–0 to Tottenham Hotspur on Jan. 4. The Blue Jackets, an NHL team that got lost on its way to Hamilton or Regina and decided to settle in Columbus, won 16 games in a row, astounding the sports fans of two North American nations, only to get squashed 5–0 by the Capitals last Thursday, falling one game short of the record. However, for spoilsports to prosper, there have to be players or teams on streaks. And, at the moment, with the return of Chelsea and the Blue Jackets to the surface of the Earth, what remains is the women’s basketball team representing the University of Connecticut, which may not lose another game until Geno Auriemma’s youngest grandchild is running the show in Storrs. On Nov. 14 the Huskies won their season opener—and 76th straight game—by two points over Florida State in Tallahassee. This caused a brief spasm of agita. A very brief spasm of agita. Through Sunday their streak had reached 89, one more than the men’s record piled up by the Bill Walton–era UCLA men, and one short of the women’s record held by an earlier generation of UConn women. The Huskies tied their record on Tuesday against South Florida and can break it on Saturday at SMU. UConn won 90 straight from Nov. 16, 2008 to Dec. 30, 2010, when it fell 71–59 at Stanford. The Huskies have lost 11 games since then, none since another loss in Palo Alto, 88–86 in overtime on Nov. 17, 2014. If not for that hiccup, their streak would stand at 137 in a row. Now that we live in the Age of the Hot Take—Tune in to Speak for Your Undisputed Supposition. What we say about the Cowboys will melt lakes of frozen methane on Jupiter!—there is nothing that overcooks the imagination like a long winning streak. Most people enjoy them. Most people also want to be watching when they come to an end. I remember sitting in a campus bar in Milwaukee on a snowy afternoon in 1974 when Notre Dame stopped UCLA’s 88-game streak. Later that season I was in the Greensboro (N.C.) Coliseum when the Bruins finally lost in the Final Four after winning seven national championships in a row. It was like witnessing the fall of the Plantagenets. 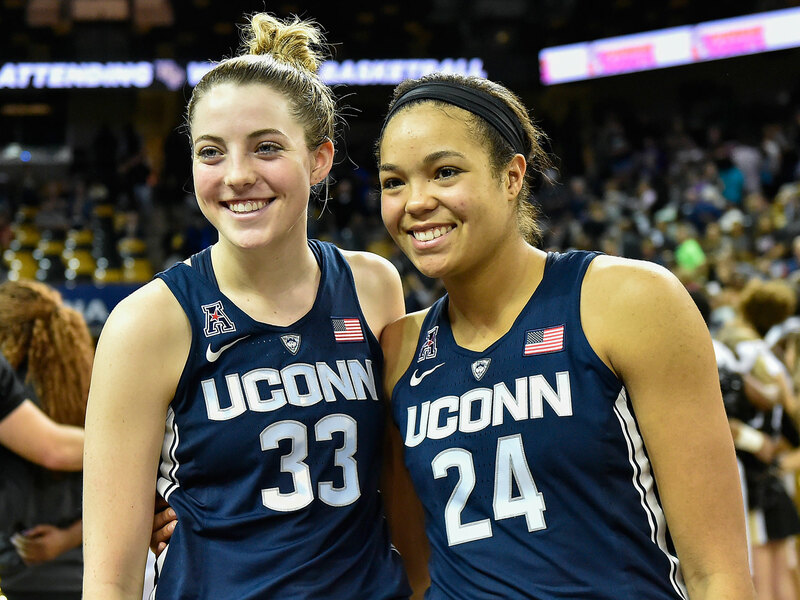 Sophomore stars Katie Lou Samuelson (left) and Napheesa Collier have never lost a college game. However, what I remember most about that tournament was being at a regional game in Tuscaloosa, while, in Tucson, UCLA was life-and-death with Dayton. This being the dim times before instant communications, the only updates we got were over the P.A. system in Memorial Coliseum and, as the Bruins’ game stayed close in Arizona and the clock ran out in Alabama, everybody waited to hear the news about the streak. Every update got a gasp or a cheer. It was inconceivable that UCLA could lose a game in the tournament. When the final score was announced—the Bruins won 111–100 in triple overtime—the entire arena sighed in disappointment. The only thing folks like more than witnessing perfection is when it ends. We’re a terrible species like that. Even so, it is argued by otherwise sensible people that streaks are somehow bad for . . . something. Back when Cal Ripken Jr. was chasing Lou Gehrig’s major league record for consecutive games played, there were more than a few people who wondered if the pursuit was damaging the Orioles’ won-loss record, as though that was what history would care about. In an increasingly distracted time, streaks concentrate attention. There is some serious value in that. More people know that the Blue Jackets exist now than ever did before. For example, let’s speculate wildly that in the next couple of months some other team stays so close to UConn that the outcome hangs in the balance over the last five minutes. That is going to be the biggest sports story at that moment. If it happens during March Madness, the attention will only be magnified. That’s a burden for the players, but one that they seem to be handling very well. In fact, that narrow victory over Florida State seems to have made the Huskies even more focused. Every win matters, not only because it keeps the streak going, but also because it can be its own beautiful moment. This is how everyone, from players to observers, should experience a streak. It’s also a way to keep the streak from becoming the joyless defense of a string of W’s. Somewhere out there is a spoilsport with the Huskies’ name on it. That team is going to do more than win a game. The streak belongs to those who end it too.